Foodspiration: How Would You Create the Perfect Chocolate Chip Cookie? How Would You Create the Perfect Chocolate Chip Cookie? What does the perfect chocolate chip cookie taste like? Crunchy and crispy? Chewy and melty? Last week at work, we held our first "food design" contest to create the Ultimate Chocolate Chip cookie. The only rule for the competition: the recipe must use chocolate chips. We made these spectacular trophies for the "Most Delicious" "Most Healthy" and "Most Creative" submissions- no they are not edible! • Most Delicious: Classic Chocolate Chip with Nuts using Ghiradelli 60% cacoa bittersweet chips made by Paul S. and David J. and served warm! • Most Creative: The Cookie Chip made with coconut and secret ingredient: avocado by K and K.
• Most "Healthy": Chocolate Chip Cookies with Dried Apricots by Lindsey Z. Sorry Lindsey, I was so busy eating your cookies, that my photo turned out too blurry to post. Chocolate + fruit= yum! 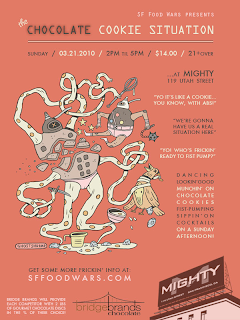 On March 21st, the SF Food Wars is having their own chocolate chip cookie contest. We've never been to Food Wars but looks like we should go! This one's already sold out but we can salivate over the 20 competitors and their cookie descriptions. Do you have an ultimate chocolate chip cookie recipe? What makes a chocolate chip cookie great?